Cellar spiders are usually found in dark corners of cellars, crawl spaces, and garages. 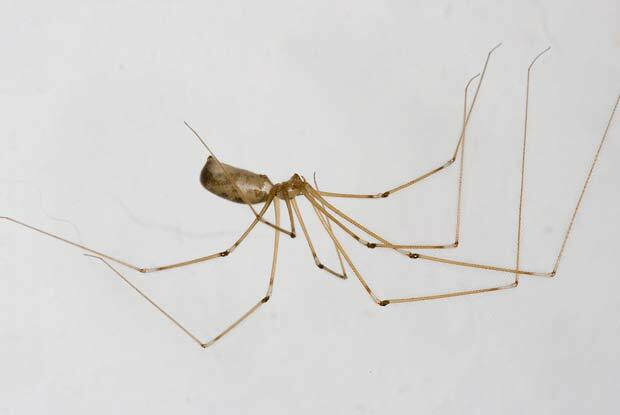 They are very long-legged and often confused with daddy-long-legs. However, they are true spiders that spin untidy webs which are often quite extensive. These are the spider webs that Hollywood creates in bad horror films. When disturbed, they characteristically vibrate or shake in the web. Female cellar spiders carry eggs by her jaws in a loose silk sac until they hatch. Female long-bodied cellar spiders produce about three egg sacs over a lifetime, each containing 13-60 eggs each. Once the eggs hatch the spider lings crawl onto the mother’s body for a short time. Development from egg to adult usually takes about one year. Adult cellar spiders may live for an additional two years. Although their bites are harmless to humans, their webs are unsightly and profuse: unlike other spider species, cellar spiders prefer to live within close proximity to one another, creating troublesome communities within human dwellings. They also lay lots of eggs and the webs can get out of control quickly if not taken care of. In cases involving considerable numbers of spiders, a spider control professional from Portland Pest Guard should be consulted. We use our knowledge of these critters to find the locations of the spiders, webs, eggs, and properly extinguish them.